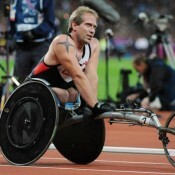 Winnipeg-born Colin Mathieson is a seasoned veteran in wheelchair athletics, having competed in his first Olympics 20 years ago, at the 1996 Olympic Games in Atlanta, GA. Colin has competed on the national team since 1995, attending every Summer Olympic Games since then (with the exception of Athens in 2004). His beginning in the sport, he says, was inspired both by watching wheelchair athletes race in the Manitoba Marathon, and by Rick Hansen’s legendary “Man in Motion” World Tour. While over half his life has been spent as a national team athlete, Colin’s greatest achievement to date lies outside the world of sport. As a full-time athlete, he compares school to a marathon, as he has taken only one class at a time between racing seasons. “It was a lot of faith that kept me moving forward, because the finish line never seemed to be in sight, until this year.” Colin is nearing the end of his pursuit of a degree in social work from the University of Manitoba. In sport, Mathieson points to hockey legend Teemu Selanne (“The Finnish Flash”) as one of his heroes, as he admires Selanne’s physical and mental tenacity – Teemu remained one of the world’s best in each of his 25 seasons as a professional hockey player. Ultimately, Colin wishes to retire from international competition both injury- and regret-free, and looks forward to starting work in his pursued field. WINNIPEG FREE PRESS (May 12) Four-time Paralympian wheelchair racer Colin Mathieson is contemplating life outside the lane.